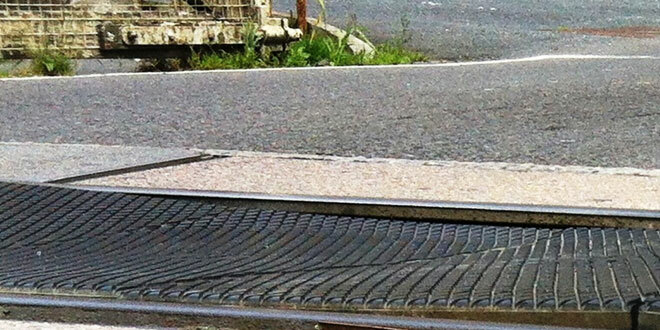 Polysafe were recently engaged to supply a new level crossing system in Bedale. The market town is a gateway to the Yorkshire Dales, experiencing high traffic from tourists and road freight so the client required a hard wearing solution that could handle heavy use. The crossing is situated on a slope down to a junction and this, combined with frequent rainy conditions, meant that the new level crossing would need to be skid resistant to prevent accidents. 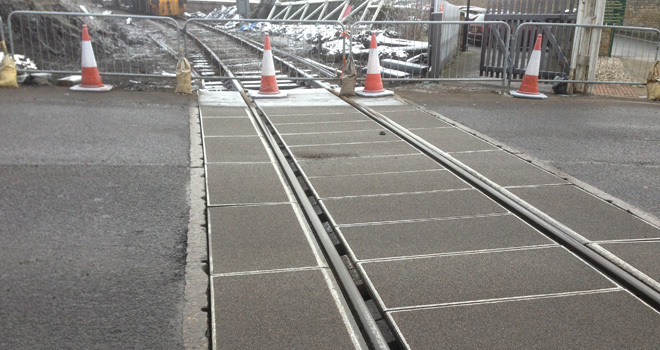 Polysafe provided their Polymer Level Crossing system which uses the latest in polymer concrete technology and offers many benefits over other systems. One of its main advantages is that the polymer surface provides excellent skid resistance even in wet weather. The polymer level crossing can also be painted in the same way as a normal road surface, meaning white lines or yellow hatching can be applied for added driver safety and don't easily wear off as they do on rubber or timber. Polysafe level crossings are renowned for their resilience with a typical concrete crossing lasting over fifteen years and a polymer crossing lasting even longer. The system features heavy duty end restraints which, in addition to the weight of the systems itself, prevent gaps even with heavy use. The clever design of the system means that it doesn't need to be full depth as it is supported by the rails and fits around Pandrol clips. This also leaves space beneath where water can drain away rather than polling around the clips and rails where it can cause damage.